SAUDI ARABIA: What’s happening in KSA? Arab Spring protests broke out in Saudi Arabia in February 2011. They were focused on reform and the release of political prisoners rather than calling for the overthrow of the regime like elsewhere in the region. The government reacted quickly to quash dissent by banning all public demonstrations and giving state employees a 15 per cent pay rise. When protests began to grow in November 2011, security forces responded by firing live bullets on peaceful protesters, killing a number of people. Activists have been targeted and imprisoned. 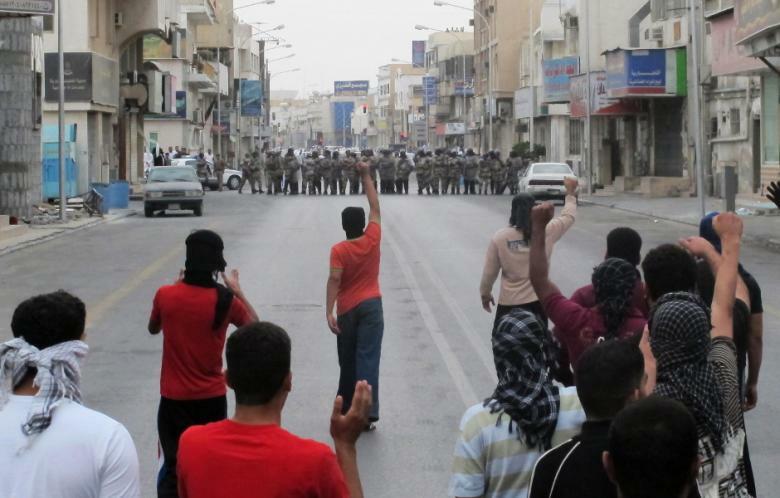 Yet, in the Qatif region and Eastern Province protests have continued despite the brutal crackdown. This, the main oil producing region of the country, is where the Shia live (allowing the government to dismiss demonstrations as a sectarian/Shia uprising or Iranian plot). Shiites make up 10 -15 per cent of the population but suffer wide-spread discrimination. They are banned from working in a number of professions in the government and military, students do not have equal education opportunities and they suffer discrimination in access to housing and rights in practicing their religion. The Shia have been protesting against discrimination for decades, but as foreign journalists are often denied permission to report from Qatif little news gets out. The movement has been revitalized by the Arab Spring and protests have been regular and have had sizable participation. But dissatisfaction with the highly authoritarian ruling Al Saud family and the repressive brand of Wahhabi Islam it promotes is not just confined to the Shia minority. The most visible campaign (at least internationally) has probably been ‘Saudi Women to Drive’ where women have organized to protest against the driving ban. Also, the country is ripe for change. Despite Saudi oil wealth, wide-spread poverty exists with around a quarter of the population living in total poverty. Large slums exist on the outskirts of the capital, especially in the south where many live in substandard and overcrowded accommodation without access to running water or electricity. Many of the poorest include female headed households (widows or divorcees) who struggle to earn a living due to the country’s severe repression of women’s rights. The poor are dependent on Zakaat (Islamic charitable giving) and begging for survival. (For a video on poverty in Saudi Arabia see here). Some 70,000 people in Saudi Arabia are stateless ‘Bidoon‘ the descendants of nomadic tribes, and not entitled to State beneifits. They are amongst the most impoverished and marginalized people in the kingdom. As Saudi women cannot pass nationality on to their children, the children of Saudi women married to foreigners are also stateless. It is probably fair to assume that there also exists a lot of resentment towards Saudi foreign policy too and the presence of US military bases and CIA operated drone bases in the kingdom. Protests have escalated recently and have spread throughout the country. The protests have been focused on calling for the release of political prisoners (human rights organizations say there are up to 40,000 political detainees in KSA many held without trail – official government figures are 11,000) and calling for political reforms. Recently the ‘sit-in for freedom’ campaign was launched and demonstrations have been organized over Facebook and Twitter. Whilst the protests are small, the bravery of people taking to the streets in face of brutal State repression cannot be understated. Many of the protests have been led by women and the protests are spreading. 5 June, Saudi Arabia clamps down on online communications blocking Viber. There have been threats to block Skype and WhatsApp. A number of prominent bloggers and twitter users are currently in prison. 7 June, women put banners and photos outside their houses and in public places with pictures of detained family members (this event aimed to get around the ban on public protests). There was strong participation in Saudi capital Riyadh and in Buraidah (Al Qassim Province, north central region). Three women were arrested in Riyadh but later released. 10 June, women hold a ‘sit in for freedom’ in several Saudi cities (including Riyadh, Buraidah, Mecca, Aljouf and Hial) calling for release of imprisoned relatives. A number of women and men were arrested. 11 June, men and women gathered to protest previous day’s arrests and were attacked, beaten and some were detained by security. 11 June, hundreds took to the streets of Buraidah in solidarity with political prisoners and demanding release of activist Hood Al-Aqil (23 years old) who was arrested in March. 12 June, in an unrelated event Indonesian migrant workers protested at the Indonesian Embassy, a riot broke out and one woman was killed. There has been a clamp down on workers without proper papers recently and those staying in the country “illegally” could be imprisoned for 2 years or have a fine of up to $27,000. Some 180,000 foreign workers without papers have left the KSA since 1 April. Around 30,000 of these were Yemenis, deported back to their impoverished country. 13 June, many women took to the streets for detainees and chanting anti-regime slogans in Qatif. A demonstration was also organized by Saudi Liberal Youth Movement in the Eastern Province against clamp down on political activists and shooting and arrest of activists by security forces in village of Al Awamiya the day before. 16 June, protest for women prisoners in Buraidah “women are a red line”. See video here. 17 June, protest as part of “sit in campaign” against the the extension of the women’s prison in Riyad. See video here. Also a women’s protest held in Buraidah in solidarity with prisoners. See video here. It is reported that around 150 people have been imprisoned in the past week’s protests. In recent days more than 70 detainees have gone on hunger strike to protest their unlawful detention and the conditions of the prison. Posted on June 18, 2013, in Middle East and tagged Saudi Arabia. Bookmark the permalink. Leave a comment.